I just recently read an article stating that miso, or fermented soybean paste, can significantly reduce the risk of developing breast cancer (even by as much as 50% if consumed regularly), so I decided that very day, to make a big bowl of miso soup for lunch. Miso soup is something I always enjoy, and I often vary my soup by adding different vegetables such as sliced mushrooms, different Asian greens including bok choy or tatsoi, and even soba noodles, along with some diced tofu. It is so quick and easy to make, that as long as you have the ingredients in the house, you can easily whip up a nice, big bowl of soup in minutes. It can really be a complete, satisfying meal in bowl. There are many types of miso, some made with just soy beans and soy koji (called Hatcho miso, a favorite in Japan) and others made with barley and rice, but all have many health benefits as shown below. The only concern is that miso is high in sodium so if you are on a sodium reduced diet, this may not be the right ingredient for you to use in your kitchen. Add the miso once you take the soup off the heat, and do not boil it, as that will destroy the beneficial effects of the enzymes in the miso paste. The 10 scientifically researched benefits of eating miso! I use a combination of white miso (mild) and red miso (little stronger) in my soup, but if you are new to miso, start with the white. Dashi is a Japanese stock, which becomes the base of many Japanese dishes, such as soup, dipping sauce, and nimono that can be found at Asian grocery stores. There are different kinds of dashi, and it can be made from kombu (dried kelp), katsuo-bushi (dried bonito flakes), niboshi (dried small sardines), hoshi-shiitake (dried shiitake mushrooms) to name the most common types. I simply buy instant dashi powder, or dashi in packets that you add to hot water to make broth. To make dashi stock, I find it easiest to simply use the instant packages you can find at Asian grocery stores. I heat 3 cups of water and add the package of dashi, then simmer for 5 minutes or so, then discard the package. If using instant powder, simply stir it into the hot water and it is ready to use. 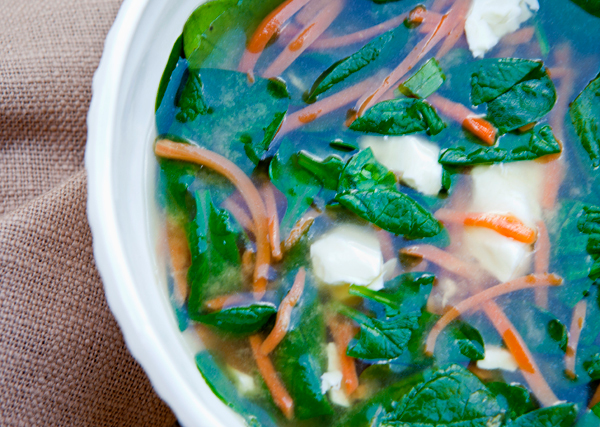 This soup is a satisfying low fat, high protein dish. 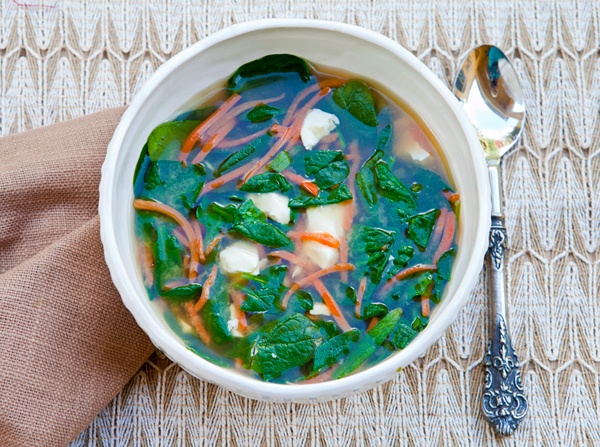 Spinach is high in vitamin K, rich in carotenoids, vitamin C, and B6. Bring the dashi stock to a boil, and add the spinach and carrots. Reduce the heat to medium low, and cook 4 to 5 minutes or until the carrots are tender. Stir in the tofu and cook another few minutes to warm. Remove from the heat, and stir in the miso paste until blended. Serve in individual bowls, and offer black pepper and chili sauce at the table if desired.